On September 11, 2001, the world stopped. A horrific and unforgettable event took place that a generation will always remember where they were, what they were doing when they first heard news of it. Just like a previous generation’s defining moment was hearing about the assassination of President John F. Kennedy on November 22, 1963. As Stephen Sondheim wrote in his musical Assassins, it was the moment when “Something Just Broke”. A generation earlier heard about the attack on Pearl Harbor on December 7, 1941 and as President Franklin Roosevelt said at the time, it was “a day that will live in infamy”. After airplanes crashed into the World Trade Center towers in New York and into the Pentagon in D.C., American airspace was closed to all traffic. Thirty-eight planes were diverted to the large, mostly unused airport in Gander, Newfoundland, Canada. The population of the area was about 9,000 and that day it increased by 7,000. 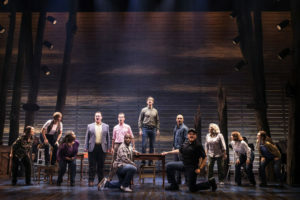 The stunning new musical Come From Away tells the story of what happened in the five days following 9/11. The show’s writers Irene Sankoff and David Hein (book, music and lyrics) visited Gander on the tenth anniversary when many of the former passengers returned to commemorate the anniversary with the friends they had made. 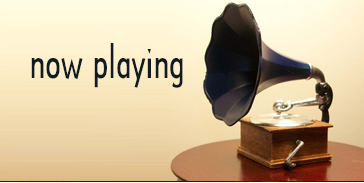 They listened to the stories and felt compelled to tell them to a larger audience. 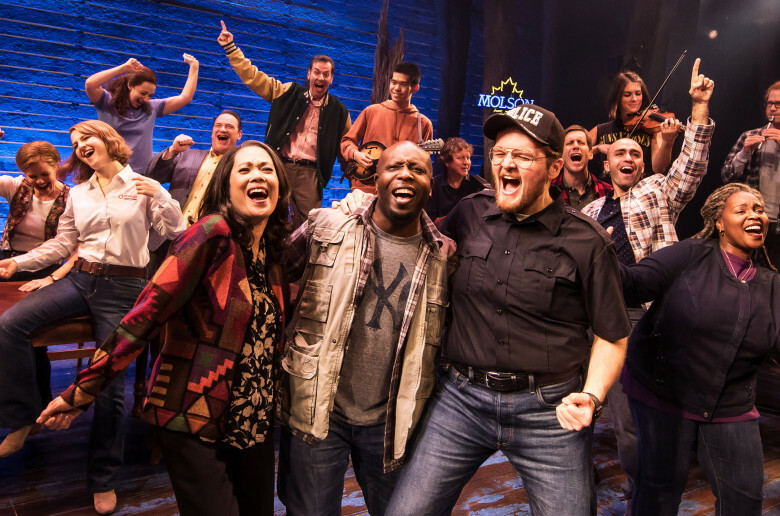 Come From Away is one of the most humanistic and joyful experiences you are ever likely to have. 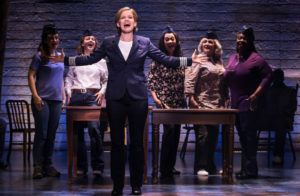 There is so much kindness and decency on display even the most cold hearted audience member won’t help but be moved. As I told a friend, even though the action is in Canada I felt I was seeing the America I was raised in, the America I grew to love as I grew, not today’s version where politicians think nothing of forcefully separating young children from their parents or shooting tear gas into crowds of mothers with young children, where schoolchildren practice drills to evade gun-toting mass murderers. The Newfoundlanders welcomed their unexpected guests with a box lunch, a blanket and a hug. They opened their hearts and their homes to strangers from around the world. They drank beer and Irish whiskey with them, they gave them bologna, caplan and moose to eat, they gave them comfort and hope when they needed it the most. Even in the telling of this tragic event, there is so much joy and humor expressed you can’t help but smile and laugh and cry, sometimes all at the same time. When leaving, the passengers try to thank their hosts, give them money, etc. when they are told “you would have done the same for us”. We all better hope that sentiment still exists today. 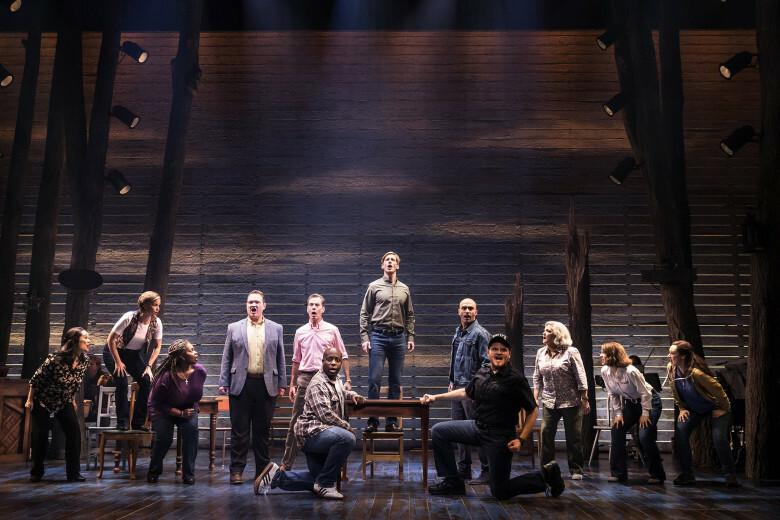 The amazing twelve-person cast enacts multiple characters, both frightened passengers and comforting Canadians. They are truly one of the finest ensembles I have ever witnessed, easily switching from one character to another with a piece of clothing, a change of stance as they create full-bodied, fully fleshed out people. Kevin Carolan (the open-hearted Mayor), Harter Clingman (the befuddled constable), Julie Johnson (the mothering Beulah), Megan McGinnis (the concerned veterinarian), Andrew Samonsky (the gay vegan), Danielle K. Thomas (the worried mother of a NYC firefighter), Emily Walton (the new TV reporter), Nick Duckart (the Muslim), James Earl Jones II (the African American suddenly in a really friendly white world). 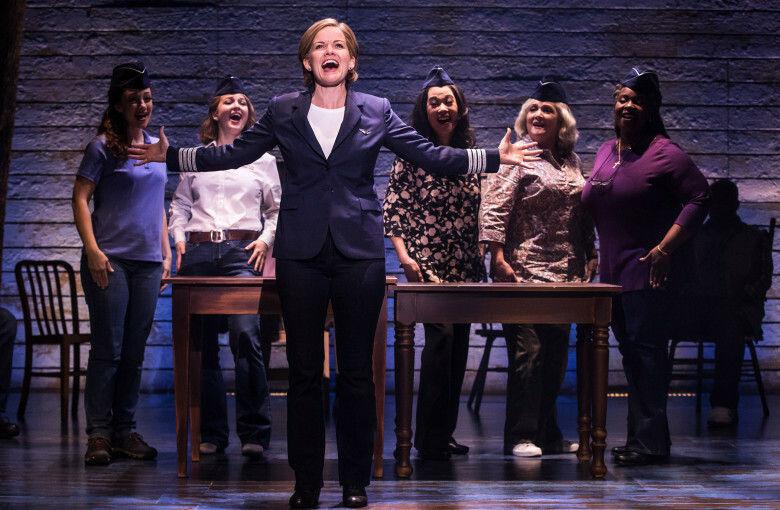 With more story time are Becky Gulsvig as Beverly, one of the first female pilots and Chamblee Ferguson as a Brit businessman who finds unexpected romance with Diane (Christine Toy Johnson), a Dallas divorcee. The writing is exemplary and Christopher Ashley has done a superb job of directing. This show looks so simple yet must have been so difficult to work on to make all the pieces fit together so perfectly. He elicits wonderfully nuanced performances from his cast as they create a multitude of characters. 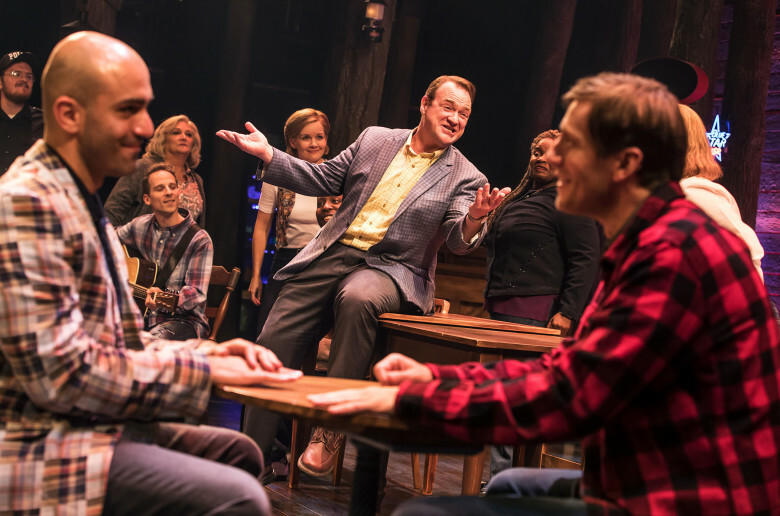 Beowulf Boritt’s simple and extremely effective scenic design consists of a slatted wood back wall, a few trees and a turntable. With just a dozen chairs and a few tables, Ashley and his cast create a myriad of images and locales. 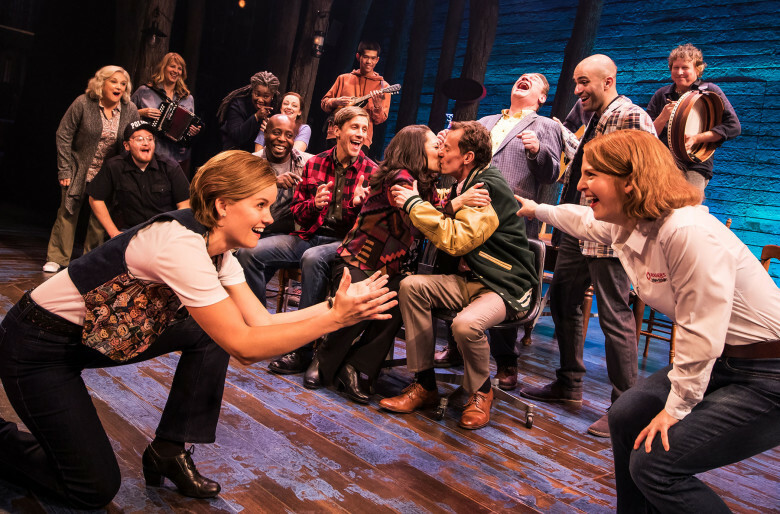 Kelly Devine has provided the lively musical staging that at times reaches the fervor of River Dance stomping, but in a good way. The eight-person on-stage band make these unfamiliar melodies feel old and comforting as well as invigorating. 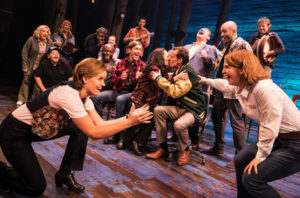 In this season of holiday giving, I can’t think of a greater gift to give my readers than the advice to see Come From Away and re-learn that there is still human decency, kindness and comfort to be found in this world. And it sings!